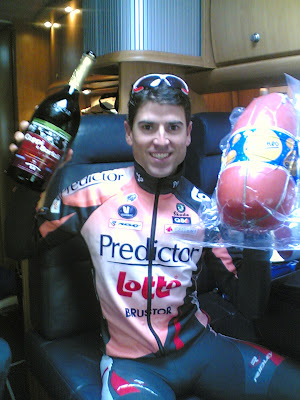 Josep and the whole Predictor-Lotto team had a great team time trial yesterday in Italy at the Coppi-Bartali stage race. 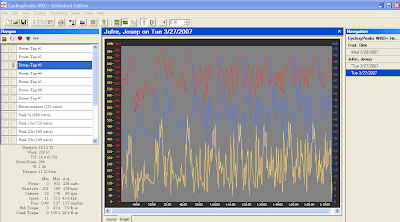 As usual, Josep downloaded his data by using WKO+ immediately after the stage and synchronized the data to his TrainingPeaks account when he got back to his hotel room. The system is working like a charm and team physician Dr De Neve can have access to all of the race and training data even when he isn't travelling with the team. 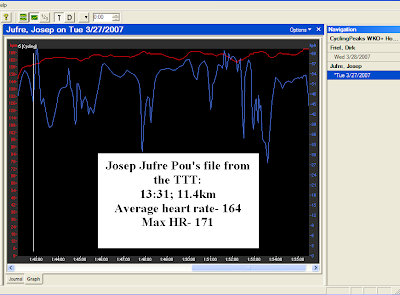 Here is a screen shot of Josep's WKO+ file from the afternoon team time trial stage. This shows his heart rate and speed. He averaged 164bpm for 13:31 and hit a max of 171bpm. Look for more from the team possibly later ion the week as this race ends Saturday. The next race we hope to get data from will be the Tour of Georgia. Predictor-Lotto came storming out of the blocks Monday to win the 11km team time trial at the Coppi-Bartali stage race in Italy. The average speed was 52kph in very dangerous rainy conditions. The time trial was the second stage of the day after a morning road stage of 95 kms. Look for the Predictor team on US soil at the Tour of Georgia April 15-22nd. Riders of all abilities are welcome. The ride will begin at ProPeloton (2615 13th St Boulder,(303) 415-1292) at 10:00 and proceed to Amante Coffee, corner of Yarmouth and Broadway, for the first leg. Then on to either Hygiene or Jamestown, with a stop at the Mercantile, or the Fruit Loops in Lyons with a stop at the Barking Dog Café, with a rendezvous at Vic's Coffee Shop (the one near Pro Peleton) back in Boulder at noon. A limited addition of the "Bernie Lieff" jersey is available for sale at $100. All proceeds will go to Melanoma Brain Tumor research-the disease Bernie died of. You may order them from ProPeloton. A great friend to many in Boulder and our cycling community.